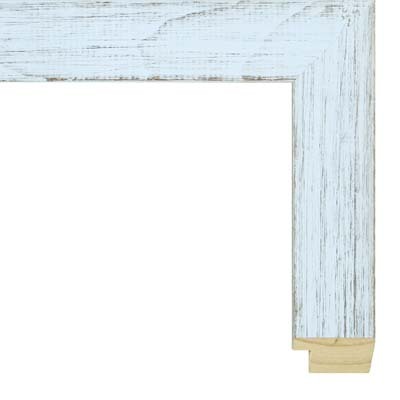 This country sky blue rustic wood picture frame features a scraped blue finish over a gray wash on a wood substrate. The profile width is 1 ½” and the rabbet depth is ½”, making this sky blue wood picture frame ideal for matted works on paper. Examples of artwork on paper that could be framed in this country rustic sky blue wood picture frame include home decor and kitchen decor posters featuring dairy products or inspirational word art, along with folk music concert posters, watercolor paintings of barns, ocean scenes featuring pastel colors, and other poster art. Additional paper art types that may be framed in this country rustic wood picture frame include screen prints, relief prints, drawings, etchings, giclee prints, acrylic paintings on paper, gouache and tempera paints on paper, pastels, and more. Canvas boards and rigid hardboard panel paintings are also possible pairings for this frame. Mat colors to consider when framing works on paper in this picture frame include options from our acid free archival selection of mats such as Omelet 9523, Tater 9618, Half & Half 9509, White Sale 9502, Chicago Blues 9544, and Black Belt 9632.